Backyard Poultry Forum • View topic - what breed are these chooks? what breed are these chooks? Post subject: what breed are these chooks? they look like a columbian something, but thats about it for me. They could be columbian wyandottes, except their legs should be yellow. Hard to say really. They are columbian Wyandottes as suggested by Jon ,and as suggested the leg colouring particularly on the cockbird is not good. Comb is a bit on the large size on the male (it will get bigger too as he ages ) He is a bit long in the leg and a bit lean (should fill out as he gets older ) He has fairly good shape and is reasonably marked. The female is not too bad overall . This only matters if you are going to show ,if not then they are nice looking birds . By the way I have yet to see a columbian yet with perfect Wyandotte comb. If you are going to breed for showing I would not consider the male . 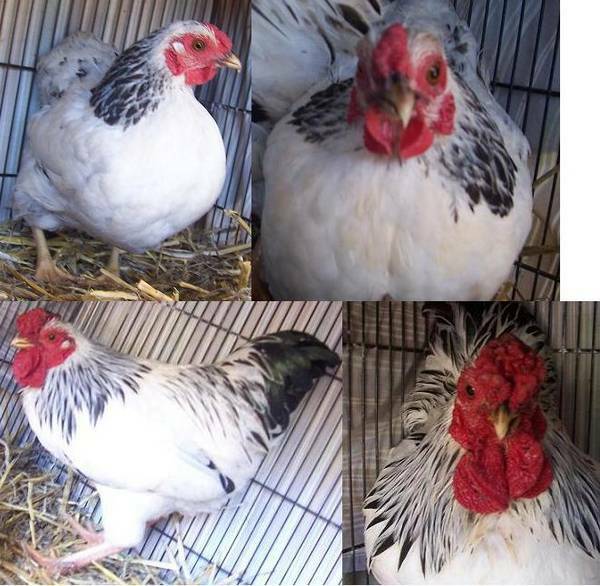 Their beaks may have been clipped as in the pictures it appears (the hen especially) that they may be twisted. Are the beaks straight and line up ok or are they crooked? You could be right about the hen(your eyes are most likely better than mine JG) I don't think it is a major concern. as said in the first post, their beaks were clipped(and its the bottom beak clipped, and i thought the proper way to clip beaks was to clip the top beak), and they are crooked, hens is more crooked, but she is obviously fairly healthy, because she laid an egg today(odd, due to only getting her yesterday, and i thought she'd be too stressed to lay), i put the egg under a broody pullet(who went broody today, funnily enough). they are my first wyandottes if they are wyandottes, and i was after some of those(preferably silver laced, though), and i figured they were most likely culls, they cost $7 each, which was fairly cheap i figured.